Toby Hoffman, for the respondent. PELLETIER J. (Reasons for Order and Order, orally):— Safia Ahmed Hussein (the applicant) was born in Jigiga, Ethiopia of Somali parents. Jigiga is a border area which is claimed by both Somalia and Ethiopia. When she was 3 months old, she returned to Somalia with her mother and never set foot in Ethiopia again. They settled in Hargeisia, Somalia. In 1979, she married a Somali citizen. The applicant’s parents were both of the Darood clan; her father was of the Geri sub-clan while her mother was of the Ogadeni sub-clan. Her husband was also of the Darood clan, Majerteen sub-clan. In May 1988 the applicant’s husband who was a sheep trader left on a regular business trip and never returned. She has not heard from him since. At about the same time as her husband disappeared, the civil war came to Hargeisa. The applicant was arrested and interrogated by security forces about her husband’s whereabouts on several occasion. He was apparently suspected of being associated with one of the warring factions. As a result of this harassment and of the attacks on Hargeisa, the applicant and her 2 children (the other two applicants) left Hargeisa for Mogadishu and then Kenya, entering that country on a false passport. They remained in Kenya for one year and two months; on September 22, 1989 they came to Canada and claimed refugee status. The first issue before the Convention Refugee Determination Division, when it heard the applicant’s claim in January and May, 1990 was whether the applicant was in fact Somali or, given her place of birth, Ethiopian. The CCRD heard evidence on Somali law to the effect that the child of a Somali citizen became a Somali citizen by operation of law, regardless of place of birth. The same consequence flowed from marriage to a Somali citizen. Given that the applicant was both the daughter and the wife of a Somali citizen, the CCRD found that she was a Somali citizen. This was the only victory which the applicant was to enjoy before the CCRD. On the basis of her evidence that she was not bothered by the authorities other than on the three occasions on which she was interrogated, the CCRD doubted that she had a fear of persecution; it characterized her treatment at the hands of the security forces as harassment. It doubted her credibility because she testified she had not made any attempt to contact her husband, nor he to contact her. They were sceptical that none of her family had been in touch with her and that she did not know their whereabouts. In the end, the CCRD concluded that “even after discounting the implausibilities in her story, the claimant has not provided us with an objective basis for her fear of persecution within the scope of the definition of a convention refugee.” This was communicated to the applicant in a decision dated January 14, 1991. 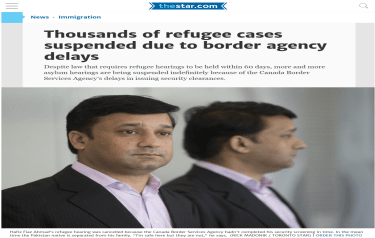 During 1994, the Minister, by way of a press release, indicated that the goal of the DROC amendments was to regularize status of certain failed refugee claimants that the Government of Canada had not removed after several years of residency and who had become established in Canada. They were to be considered exceptional cases and could come under the new regulation provided they had not avoided immigration authorities. The applicant was a failed refugee claimant who had been in the country for 3 years following the refusal of her refugee claim. She therefore appeared to be the type of person for whom the program was designed. You must send a notarized statutory declaration regarding your husband, Adbulkadir Yusuf. If you do not know where he is, you must sign a statement to that effect – witnessed by a notary. We cannot make a final decision in your case until you have sent that information. All persons seeking permanent residence in Canada must provide adequate proof of identity, otherwise permanent residence may not be granted. Adequate proof could be a passport, travel document or identity card issued by the Country of Citizenship. You must provide an official translation of these documents in either English or French. You sent a translation of your ID Card and your children’s birth certificates. If you have additional identification you must send it immediately. If you have any identification from Ethiopia – you must send it to this office. As you were born in Ethiopia you should apply for an Ethiopian passport immediately. Please be advised that this is our final request for this information. You have 60 days to comply with this request or your application for permanent residence will be closed and a new application with new cost recovery fees will be required. If for some reason you are unable to comply within 60 days, please advise us in writing of the reason for the delay. Mr. Berger responded to this request on the applicant’s behalf on September 27, 1997. He took offence at the suggestion that the applicant should obtain an Ethiopian passport, given the CCRD finding that she was a Somali citizen. He noted that the applicant had already provided the Processing Centre her original Somali identity card as proof of her identity. He suggested that processing of the application should proceed without further delay. – I think we have nothing to gain by not even considering to apply waiver and finalize the case. – If we do not want to waive Please consult with [ ] On Who should e-mail be addressed to in NHQ [illegible] stated in P.M. or should we waive ourselves. To be exempted from this requirement the government of the applicant’s country must be in a state of total and ongoing collapse to the point where the country no longer has official representatives in other countries at consulates or embassies. At the time this was written, Schedule XII to the Immigrations Regulations 1978 listed two countries where it was recognized that the machinery of government had broken down completely: Afghanistan and Somalia. On April 8, 1998 Mr. Berger forwarded to the Processing Centre the applicant’s Personal Information Form in response to a telephone request from the case officer. – I have difficulty determining if document is satisfactory without original document & info from the applicant – eg: did she have document in Somalia before she left & then had someone send it to her or did she obtain document after arrival in Canada? She only produced document to CPC in 96 after several requests for it. Even though it is dated 1988, I am not satisfied (at this point) that it was issued in 1988 as she states she obtained it well after her refugee claim. I am not satisfied with the documentation provided for the children. Again, it was obtained well after her refugee claim & only appeared after we requested . I am, however, satisfied that she had 2 children from statements in her P.I.F. & that in all [sic] likelyhood these are her two children. As well the documentation is similar to documents known to be not genuine. The next entry in the Tribunal Record are the case officer’s notes of a telephone conversation with the applicant. Phoned applicant 11:45 am at 416-429-9549 & confirmed that I was speaking with Safia. I questioned if she had the identity document when she came to Canada. She replied no. I questioned if she had the identity document while she was in Somalia. She replied no. I questioned how she obtained it. She replied that she asked her relatives in Somalia to get it. I questioned when she obtained them. She replied a while ago. I questioned further – asking what year she obtained them. She replied “I think 1997”. I questioned again – did somebody have them in Somalia & send them to you or did you get them later. She replied she got them later. I questioned – did you get the document at the same time you got the children’s birth certificate? She replied yes. I questioned why the issue date is 1988. She replied she didn’t know. Given the answers she provided to my questions, I am not satisfied that the National I.D. card provides credible evidence of the principal applicant’s identity. In determining whether or not applicants meet the requirements of Regulation 11.401(b) the officer must satisfy him/herself that the documentation is genuine, belongs to and adequately identifies the holder. The officer interviewed Ms. Hussein by telephone to discuss her application and the identity documentation in more detail. Based on this interview, an examination of the documentation and an assessment of all the information available, the officer was not satisfied that Ms. Hussein met the requirements of this Regulation. An officer is not obliged to waive this requirement if the applicant cannot otherwise be satisfactorily identified. The officer concluded that an exemption was not warranted. The length of time taken to process this DROC application was due to the length of time required for the applicant to attempt to comply with landing requirements, as well as the time required for our office to undertake background checks. In my opinion our office was procedurally fair and generous in providing Ms. Hussein with sufficient time to attempt to comply with landing requirements as well as in taking the time to verify information, and I believe there were no undue processing delays. Mr. Berger attempted to have the decision reversed administratively by providing evidence of identity from Somalis now resident in Canada who knew the applicant in Somalia, as well as providing evidence of the risk of harm to the applicant in the event of her return to Somalia. This was rejected by the Minister’s representatives. This application for judicial review was made soon thereafter. In her application the applicant asks that the decision that she does not meet the eligibility requirements under the Deferred Removal Order Class be set aside on the ground of error of law in the interpretation and application of the Immigration Act and Regulations, specifically in the failure to grant her a waiver of the documentation requirements. The respondent’s position is that since documents were provided, the question of a waiver does not arise. The waiver only applies if documents cannot be provided. Although the duty of fairness is flexible and variable, and depends on an appreciation of the context of the particular statute and the rights affected, it is helpful to review the criteria that should be used in determining what procedural rights the duty of fairness requires in a given set of circumstances. I emphasize that underlying all these factors is the notion that the purpose of the participatory rights contained within the duty of procedural fairness is to ensure that administrative decisions are made using a fair and open procedure, appropriate to the decision being made and its statutory, institutional, and social context, with an opportunity for those affected by the decision to put forward their views and evidence fully and have them considered by the decision-maker. In this case, all communication between the Processing Centre and the applicant had been through Mr. Berger’s office. He forwarded the initial application on the applicant’s behalf. All requests for documentation were forwarded to Mr. Berger and all documentation supplied passed through his hands. He responded to inquiries from the Processing Centre staff. He responded to inquiries about the applicant’s documentation. There is no question that the Processing Centre staff were aware of his involvement. The applicant has been harmed because, unknown to her, there was always the possibility of a waiver of the documentation requirement, a possibility which had been discussed internally by the Processing Centre staff. Had counsel been involved in the interview, the question of waiver could have been raised in the context of the information which the Processing Centre staff were seeking. Counsel could have said for example ” Listen. It is obvious you are suspicious of the documentation, but do you have any real reason to doubt that this woman is who she says she is? We can provide evidence of identity from her community. If we do that, will you exercise your discretion to waive the documentation requirement?” The entire tone of the interview would have changed and the likelihood of a mutually satisfactory outcome would have increased. Instead, the Processing Centre’s suspicions were confirmed, their position hardened, and the die were cast. These were very particular circumstances. It was known to the respondent’s officials but not known to the applicant (or at least not communicated to the applicant) that the answers given in the conversation would result in the dismissal of her application. It was known to the respondent’s officials but not communicated to the applicant, that there existed the possibility of an exemption which would result in the acceptance of her application. Whether the exemption applied and whether it should be claimed in the course of the interview are matters upon which the applicant would have benefited from legal advice. There was a consistent course of dealing by which the respondent directed all inquiries through the offices of counsel. In those circumstances, bypassing counsel was a breach of the duty of procedural fairness contrary to s. 18.1(4(b) of the Federal Court Act. In the result, this application succeeds.